If you are planning to purchase a large number of Kiosk Pro licenses, you can sign up for Apple's Volume Purchase Program for Business or for Education to easily purchase and distribute the app. Enrollment is free and currently available in the following countries: Australia, Austria, Belgium, Brazil, Canada, Czech Republic, Denmark, Finland, France, Germany, Greece, Hong Kong, Hungary, India, Ireland, Italy, Japan, Luxembourg, Mexico, Netherlands, New Zealand, Norway, Poland, Portugal, Singapore, South Africa, Spain, Sweden, Switzerland, Taiwan, Turkey, United Arab Emirates, United Kingdom, and United States. While you must have a presence in one of the countries list above to enroll, as of iOS 9, apps purchased through VPP can be assigned to users or devices in any country where the app is available. Volume Purchase: Buy as many licenses of an app as you need in a single purchase. Managed Distribution: You can distribute apps under your own profile. When apps are no longer needed by a user or specific device, they can be revoked and reassigned to a different one within your organization. Multiple Payment Options: Complete your transaction with a credit card or under certain conditions, payment can be made by purchase order. You can also use PayPal in the United States, or ClickandBuy in the United Kingdom, France, Germany, Italy, and Spain. Tax Exempt Status: Apple recognizes the tax status of educational organizations. If your organization is tax exempt, you can save money by buying through the VPP for Education. Once you sign up for the Volume Purchase Program with an Apple ID, that ID can no longer be used on an iPad or iTunes to make purchases or redeem codes. In order to keep the purchasing ID and redeeming IDs separate, Apple will also not allow you to sign up for the VPP with a Apple ID that has already been used to make purchases or redeem codes. Once you have enrolled in VPP, you can sign into your VPP portal by going to http://vpp.itunes.apple.com and can immediately purchase multiple license codes of our regular iTunes versions. With managed distribution, your organization retains ownership and control of apps purchased through VPP. You can assign apps to users or specific devices and can revoke and reassign the apps as needed. Alternatively, you can use redemption codes which permanently transfer ownership of each app license to an individual iTunes account through iTunes or Apple Configurator. With managed distribution, your organization retains ownership and control of apps purchased through VPP. You can assign apps to users or devices and can revoke and reassign the apps as needed. Managed distribution of VPP licenses requires the use of either Apple Configurator 2 or a mobile device management (MDM) solution that supports managed distribution (like SimpleMDM). You'll need to talk to your MDM provider directly about their process for distributing these managed license codes. To use VPP redemption codes you have purchased, you'll need to make a unique ID for each device to redeem a code or use Apple Configurator 2 to assign licenses through a administrative Apple ID. Note: It is not possible to use the Apple ID you associated with your VPP account to redeem codes. Once connected with the VPP, this ID is unique in that it can only be used to sign into the VPP portal to make purchases. This VPP Apple ID cannot be used on an iOS device or in the desktop version of iTunes to authorize a computer. Create the ID at https://appleid.apple.com/. Verify the email associated with the ID. While in iTunes hit Ctrl + B to show the menu bar at the top of the pane. Authorize the computer for that ID, which will start a 'Hi, you've never been here before' sequence that asks you to verify your address and add payment information or a VPP or promo code. Adding one of the VPP codes provided should enable a 'None' option next to the credit card/Paypal options. You can then check that the license code successfully applied to the account by going to the Library button in the top left corner of the screen (will probably be on the default 'Music' tab), clicking on 'Apps' and confirming that Kiosk Pro is available. If it didn't download automatically, you can go to the home screen of the App Store in iTunes (Ctrl + Shift + H) and look under 'Purchased' in the right sidebar, find the app and click 'Download'. 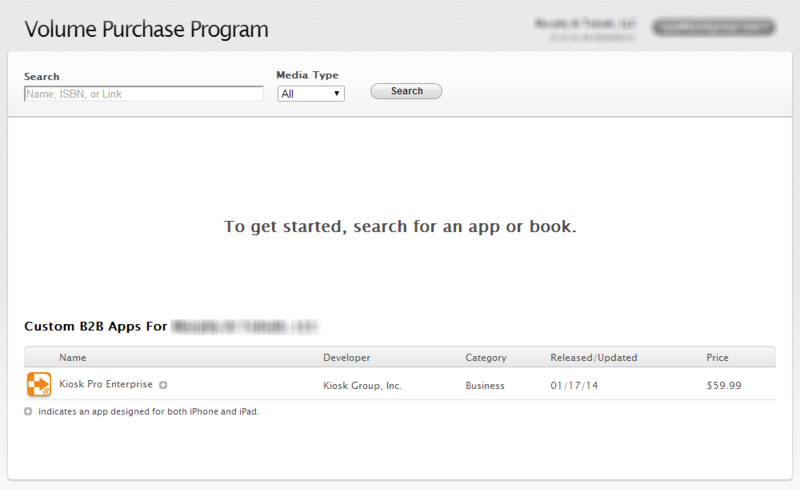 Open the App Store app on a device associated with that ID. Check to make sure you are in the 'Featured' tab at the bottom of the screen. Scroll down and click the 'Redeem' button at the bottom of the page.